Birmingham might not be renowned for its viniculture but the city is set to take centre stage later this month as the setting for one of the biggest events yet to promote English wine. English Wine Takeover is the first dedicated domestic wine event to take place in the Midlands and aims to increase awareness of a fast-growing industry. Although the majority of English wine production takes place in the South - concentrated in Kent, Sussex, Surrey and Hampshire - there are 92 vineyards across the East and West Midlands, including Buzzard Valley near Sutton Coldfield , Bearley near Stratford-upon-Avon, Halfpenny Green in Stourbridge and Spring Cottage in Walsall. Every county in England as far north as Yorkshire has a vineyard and last year the first vineyard in Scotland produced a grape harvest. Last year around 4.45 million bottles of English wine were produced from 445 vineyards covering 3,500 acres and that figure is rising, though the pace of growth is dictated by the fact it takes up to four years for grapes to be ready for wine-making after vines are planted. Starting from scratch it takes five years for a still wine and seven years for a sparkling wine to reach the table. 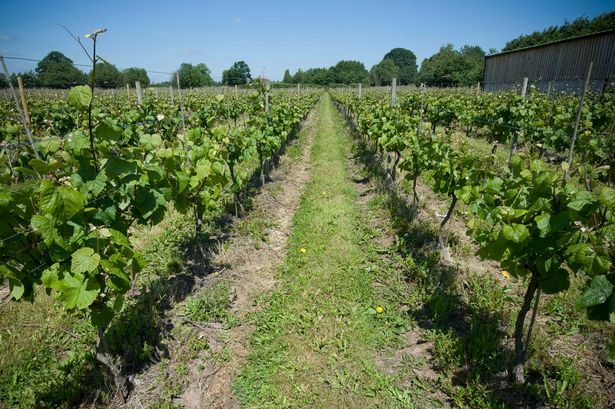 Julia Trustram Eve, marketing director at English Wine Producers the body, for the English and Welsh wine industry, said: “The English wine industry has seen a remarkable increase in the last ten years and the acreage planted by vines has doubled. “More vines are going in this year and next year there is going to be more expansion. English wine is still in its infancy relatively speaking. Although the Romans planted vines in the first millennium the modern industry has only been going since the 1950s. Initially red and white grapes were imported from Germany, though over time the types of grapes grown and wines made have changed, with sparkling wine now accounting for around two-thirds of all English wine. Ms Trustram Eve added: “It was not until the 70s that it started to take off. “In the 80s and 90s vineyards started to be planted with vines for sparkling wines, the three grapes used to make Champagne - Pinot Noir, Meunier and Chardonnay. English wine - particularly the sparkling variety - is also gaining a reputation for its quality. Ms Trustram Eve added: “The proof positive of how good English wine is can be seen in how successful it has been in competitions around the world. With supermarket giants like Waitrose and Marks & Spencer getting in on the act the future looks bright too. “It is great to see big names behind it,” said Ms Trustram Eve. “Waitrose announced sales of English wine have risen by 177 per cent, while M&S has expanded its range of English wine. Waitrose even has its own vineyard and has produced its own sparkling wine. The Birmingham English Wine Takeover sees a series of events across the city during English Wine Week from May 22. They include food matching with a range of cuisines, tutored producer-led tastings and a blind tasting sparkling masterclass at Loki Wine - culminating in a producers’ festival on Saturday May 23 at The Bond, Digbeth. English wine might not be cheap, and should not be confused with the similarly titled British wine - which allows for wine-making using imported grape juice - but Ms Trustram Eve emphasised it is a premium product. She said: “If compared to a Chilean bottle of Cabernet Sauvignon at £3.99, you’re looking at an average of £11-12 for still and £20-25 plus for sparkling, so what you’re talking about is the premium end of the scale. “The important thing is to make sure the quality matches the value. * To find out more about English Wine Takeover events in Birmingham visit www.englishwinetakeover.co.uk.